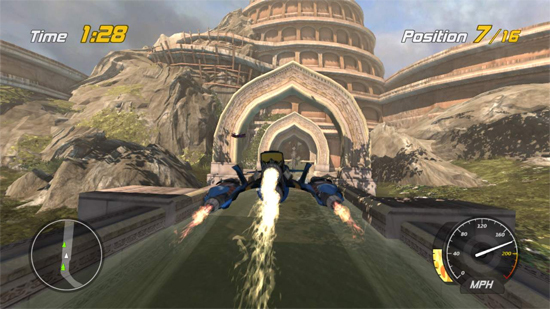 As you may remember, my feelings on Hydro Thunder Hurricane were of the positive variety. But as good as the gameplay was HTH did seem a little on the short side with only eight tracks to quickly run through. It wasn’t a big problem as the game was an XBLA game and not full retail price but I was left wanting more. We’re working on a DLC pack now, but we have so many more ideas that I would love to get out there. Lots of people have asked us for revamps of some of the original tracks – who knows? Anything is possible, right? It’s not known when this first DLC will be available or at what price but I can guarantee that I’ll be picking it up. As for revamps of the original tracks, that would be fun to see but I’d be more excited to see some new creative ideas put to use rather than prettied up tracks I’ve played before. Oh man I would love some of the original tracks with an graphical facelift. Greek Isles and Boat Graveyard, please.